Luke enjoying his first solid meal. Tula’s pups have been nibbling at her dinner the last few days, so we decided it was high time to wean them. I tend to feel less of a rush for weaning when I’m dealing with a mom like Tula, who has remained fat and happy throughout this entire litter. Her kids are both chubby and healthy, and Tula is still flowing with milk. Still, all good things come to end, and it’s time for Luke and Leah* to start eating solid food. In the ‘old days’, I weaned onto rice pablum mixed with goat’s milk, eventually adding in some raw meat. The last few litters, however, I’ve gone straight to raw and the pups seem to just love it. I’ve been a bit short on time lately – which is more than just an understatement. Between work, Pickle, the other puppies, and the ten gazillion emails currently sitting in my inbox, the last thing I have time for is a three day raw food making spree. At times like this, I’m grateful that there are raw food short cuts available. 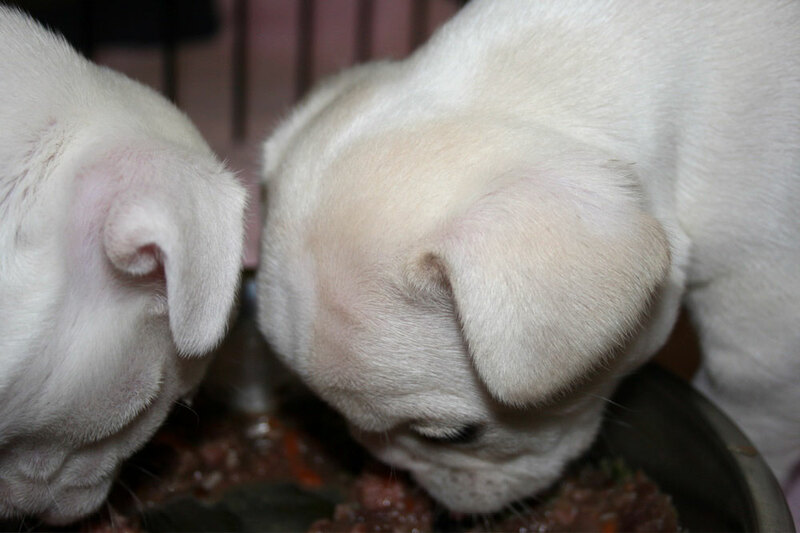 Several companies offer ‘base mixes’ that allow you to make your own, home made raw pet food, without all the grinding, blitzing, food processing and mixing. Just pick your own protein of choice, add a few ingredients (or, in some cases, none at all), mix with the raw food base, and package. That’s it. You can make a week’s worth of raw in an hour or even less. Here are some of the shortcuts we’ve tried and like.